Easement and right of way are two distinct examples of property rights. Although they bear similarities, they are completely different in a number of ways. An easement is an example of a property right that permits a third party to use another person’s movable or immovable property. The easement holder is allowed to exercise control over parts of the property covered by the easement. However, the full ownership of the property still remains with the owner. An easement may be granted by either a public entity or a private individual and it exists in two types: affirmative and negative. An affirmative easement grants the easement holder the power to use the property of another person for a specific purpose, while a negative easement restrains owners from exercising full control over their land. A right of way, on the other hand, is a type of easement that grants a person the freedom to use parts of a private property as a passageway. Constituted on an immovable or real property, a right of way is given to a person by either usage or grant. Typically, a right of way easement covers a pathway or a road that passes through another person’s land. Right of way easement holders are granted access to areas that serve as passageways to main roads or highways. 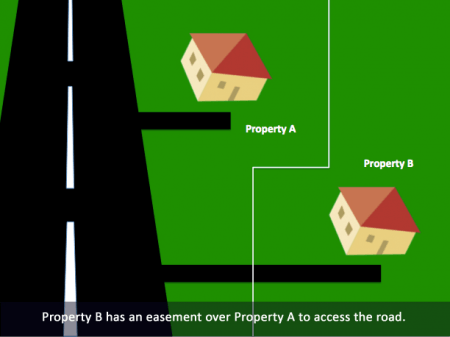 So what’s the difference between an easement and a right of way? Firstly, an easement is an example of a property right that permits a third party to use another person’s movable or immovable property. A right of way is a type of easement that grants a person the freedom to use parts of a private property as a passageway. Secondly, an easement is broader in scope. Depending on the type of easement, easement holders are granted the power to either exercise rights on a private property or to restrain private property owners from building or developing infrastructures in their land. A right of way, by contrast, is a type of easement that grants the easement holder as specific right – the right to use parts of a private property as a pathway in accessing main roads. An easement exists in two types: negative and affirmative. A negative easement is typically granted to prevent the property owner from developing infrastructures that block the third party’s access to air, light, or views. Meanwhile, an affirmative easement is a type of right granted to a third party to use the property of another person for a specific purpose. An example of an affirmative easement includes “right of way,” which grants easement holders the right to cross a private property to access main roads or neighboring properties. 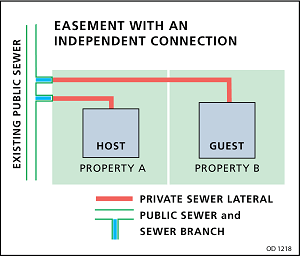 Lastly, an easement may cover different parts of a property, including pathways, drainages, and underground areas. A right of way, on the other hand, only covers parts of a private property that serve as pathways to main roads and neighboring properties.